If South Wales has been historically British rugby union's great hotbed, there is little doubt that the heat has been greatest in Llanelli. 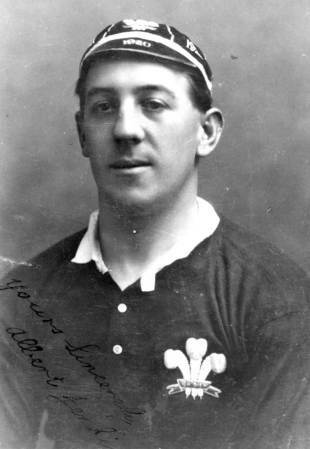 And nobody, not even Phil Bennett or Ray Gravell, has been more of a hero to that richly idiosyncratic, volubly bilingual industrial community than Albert Jenkins who died 60 years ago, on October 7 1953. If Jenkins' misfortune was that, at the highest level, the 1920s were among the grimmest decades in Welsh rugby history, he was more than compensated at club level. Jenkins played for the Scarlets for a touch under 10 years, making his debut in March 1919 and his final appearance in January 1929. During that time they won three times as many matches as they lost, beat the New Zealand Maoris, gave the invincible All Blacks of 1924-5 one of their few severe tests and carried off the Welsh unofficial championship in 1927-8. Such records cannot be achieved by the sole efforts of one man. The Scarlets boasted plenty of talent in the shape of men like half-backs Dai and Arthur John, back rower Ivor Jones and centre Ernie Finch during this time. But as Rowe Harding, a Welsh wing of the 1920s, wrote in his memoirs "The greatness of Llanelli from 1920 to 1929 was the greatness of Albert Jenkins". Jenkins exemplified the democratic possibilities of rugby union in South Wales, that it might make a man of unpretentious manner and occupation - he was at various times a fitter, a tin-plate worker and a docker - into a local giant. As Harding wrote he was 'a corporate property' in his home town. "Everyone from the Mayor to the smallest street urchin called him Albert". Born in 1895 he came, because of the First World War, relatively late to senior club rugby - making his reputation as a full-back for Forces teams before joining the Scarlets as a centre in 1919. His gifts were immediately and vividly obvious. Harding, an acute observer of his fellow players, reckoned him perfectly equipped for his role on the field :"He was of ideal build, five feet eight inches in height, with the chest and shoulders of a bullock, powerful thighs and the trim well-turned calf and ankles of a sprinter. His pace for thirty yards was terrific", while "I never saw a man with such an instinct for doing exactly the right thing". WJT Collins described him as "one of those attractive and impressive centres who delight the crowd by the variety of their gifts, their daring, and those flashes of imagination which lead to unexpected scores". Jenkins scored 121 tries for the Scarlets - including 28 in the 1920-1 season - was a prolific kicker and dropper of goals, could punt huge distances and had an impermeable defence. He was captain of the Scarlets for five seasons between 1920 and 1926, Harding recorded that team-mates "told me that they felt a supreme confidence when Jenkins was playing and a corresponding sense of insecurity when he was absent". Even his critics acknowledged his brilliance. WJT Collins, perhaps the sharpest and most perceptive of Welsh critics in his time, rated him "just short of the superlative class" because of occasional lack of judgement in the timing and type of pass, but still wrote that "in many games he touched greatness". Local legend credited him with the ability to play fuelled by large quantities of beer, discreetly disappearing to the gents at half-time or during breaks in play. Among his contemporaries Finch "would have none of it", although Gwyn Francis recalled that his "capacity for absorbing beer without turning a hair was truly phenomenal". Historians Dai Smith and Gareth Williams reserved judgement, but said the myth was "such as only legendary figures generate". "It was one of the great rugby idiocies of the decade that Albert Jenkins won only 14 caps"
While sometimes irked by the attention he received at home, he was also reluctant to travel far from it - a disinclination which, in the face of huge offers by the standards of the time, prevented his following the well-beaten path from South Wales to rugby league. Even allowing for the famed partisanship of Llanelli's fans and local press, quick to complain of both real and imagined selectorial myopia, his treatment by Wales was bizarre. Like Bleddyn Williams a generation later, his international record was outweighed by immense club achievements. His international career lasted eight years, yet he played only 14 times for Wales. Perhaps the most notable was in 1921 against Scotland, in a match at Swansea marred by crowd invasions, when he single-handedly dragged Wales back from an 11-point deficit with a barrage of drop-kicks that might with a little more luck - he landed two and was only narrowly wide with two more - have anticipated Jannie de Beer's destruction of England in the 1999 World Cup by more than three-quarters of a century. Wales fell just short and the crusty EHD Sewell criticised him for 'obsession' with the tactic, but Harding hailed "the finest piece of single-handed courage and skill I have ever seen". In 1924 Wales fielded seven different centres in five matches, but Jenkins played only once - against the All Blacks. He was then dropped for four years, reappearing briefly in 1928. He was captain twice, against Ireland in 1923 and 1928, but each time was dropped immediately afterwards - the last time his one undoubtedly poor game for Wales. But these experiences were symptomatic of the era. Only once between 1923 and 1929 did Wales pick the same captain for consecutive matches. His last match for the Scarlets was, suitably for a Llanelli man, against Swansea in February 1929. He came close to a comeback three years later, but decided against it. His later years were dogged by ill-health and he died young, aged only 58. Albert Jenkins was not born in the wrong country - individual genius has invariably found appreciative audiences in Wales. But he may have been born at the wrong time. As Smith and Williams, dispassionate chroniclers and, as East Walians, free from any taint of Scarlet fever, recorded of the Welsh miseries of the 1920s: "It was one of the great rugby idiocies of the decade that Albert Jenkins won only 14 caps".